The United States’ role in Libya has varied from a very active one under the Obama administration into a more predictive and sit-and-see role under the Trump administration, which has engaged very little over the last two years in Libya. An incident that has taken place this week is an alarm that should be heard in the news, despite the little coverage it has gained so far locally and internationally; that is the visit of the Libyan Head of High Council of State (HCS), Khalid Al-Mishri to Washington. Al-Mishri is known to be a member of the Libyan Muslim Brotherhood Group and he has been a member of the HCS since the kickoff of the body in 2015, yet in late January, he decided to quit. He appeared in a televised statement detailing his resignation from the Muslim Brotherhood Group, citing his focus on political work and saying he would be working for the Libyan people in a way that helps achieve their inspirations. To all appearances, Al-Mishri needed not to publish a footage to say he is not a Muslim Brotherhood member, yet to the best of Al-Mishri’s knowledge, he seemed to desperately want his resignation to be heard and seen – not in Libya – but in the International arena, especially in the US. Shortly after his resignation, HCS’s media office announced that Al-Mishri was going to visit the US Congress and make an address, besides other meetings he would attend in the US for different purposes. 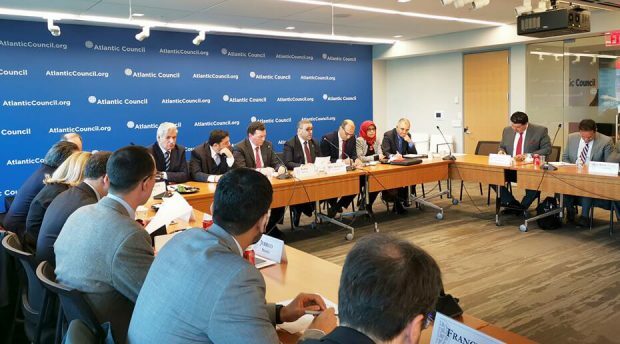 Al-Mishri met with members and academics of the Atlantic Council and officials from the US Commerce Chamber, whom his media office said promised him to consider resuming investments in Libya. Now, one can say that the whole invitation of the HCS’s Head to the US is just a kind of US support for the country, yet the blindingly obvious coincidence of the timing between Al-Mishri’s resignation from Muslim Brotherhood Group and the visit makes us skeptical of the aim of such a move, which could be the setting up of a new ally to the US to be elected later in Libya if the elections happened to take place anytime soon.